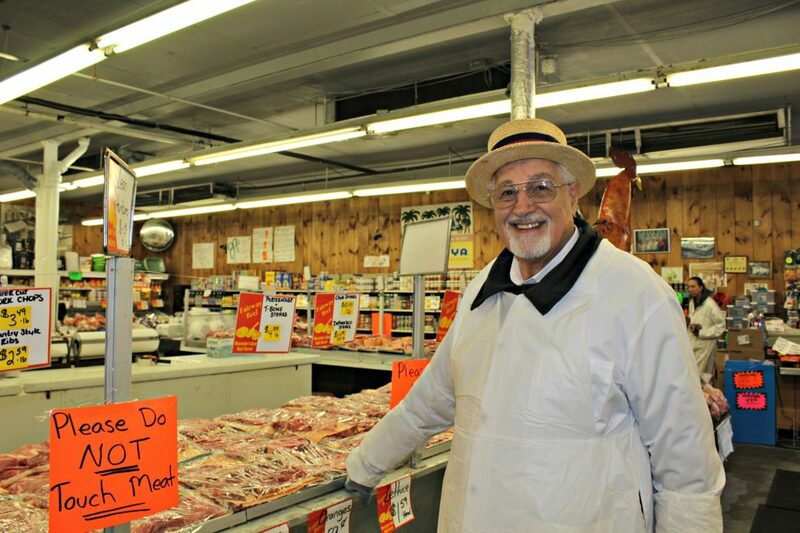 A familiar sight with his signature straw hat: Fairway Beef owner George Sigel. Survivor Series is an occasional series highlighting Worcester businesses that have stood the test of time. Do you know of a long-running business with a unique story that fits the bill? Contact us at info@worcester.ma. It’s got character — and characters — charisma and class. It’s also a microcosm of the American Dream. A 7-year-old Russian immigrant comes to the United States, eventually lands in Worcester, and grows up to own his own business. And leaves a legacy of success to his four sons. 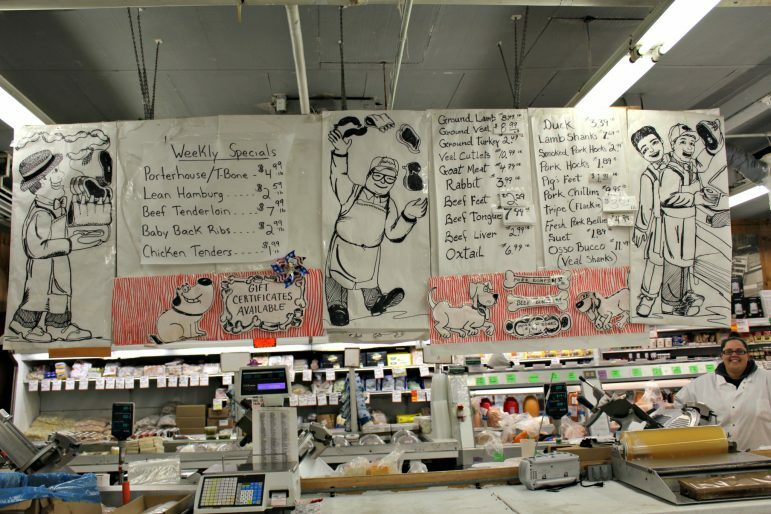 Seventy-one years later, Fairway Beef stands in the same place as a testament to hard work, community, endurance and pride — a success story built on hard work, integrity and low prices for consumers. If one visits the establishment and concludes, “They certainly don’t make ‘em like that anymore,” that’s the best compliment anyone can offer, according to George Sigel, one of the four sons of Manny Sigel, that 7-year-old who arrived at Ellis Island. 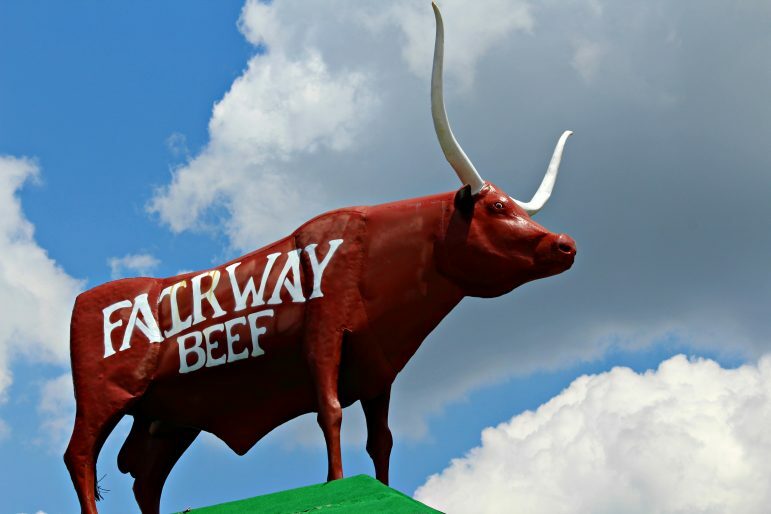 This big bovine will steer you in the right direction — if your’e looking for Fairway Beef. Now 82, George is the front man. With the straw hat and big smile, you can’t miss him if you tried. His youngest brother, Jack, 66, also works at Fairway. The other two brothers, Marty and Jerry, are retired and live in Florida. Jerry lives there year-round, and Marty is a “snowbird” who summers on Cape Cod. Both worked in the family business at either Fairway Beef or Boston Beef Company, a wholesale meat business started by their father on Lafayette Street. That business closed in the 1980s. “I may be 82, but I’m not going down to Florida to retire anytime soon,” George said. “This is my hobby, and my wife knows it, too. You can’t take me away from this. I’d rather be here working and greeting the customers. I’m definitely looking to go as far as I can, as long as my brothers are willing to have me here. “I’m proud to be part of the family and working with my brother, Jack, to keep this going. I’m very fortunate,” he said. The only “advertisement” is the life-sized Texas steer that sits atop the building overlooking the intersection of Franklin and Grafton streets. Fairway sold its products to many of the supermarkets in the Greater Worcester area. “We even sold to a few restaurants, including the famous Hilltop Steak House in Saugus,” George said. “We also sold to Army and Navy bases. With 15 trucks going out daily, we did a very good business up and down the East Coast. Meats, steaks, chops, and cold cuts were the staples of the business from Day 1. And the weekly specials remain today as they did 71 years ago – a very visible vestige of the past. As might be expected, change comes slowly to Fairway Beef. The cooler concept keeps the various meats fresh because everything is done here. The beef is imported from Colorado and other Midwest states. And no matter the meat (pork, chicken, duck, goose, rabbit or beef) it all must be USDA-approved, George said. The produce comes from California to Massachusetts. One product that is not in the store: bananas – the store is too cold. It’s only been about 10 years since Fairway introduced vegetables. Now, the aisles have farm-fresh produce to accompany every meal. 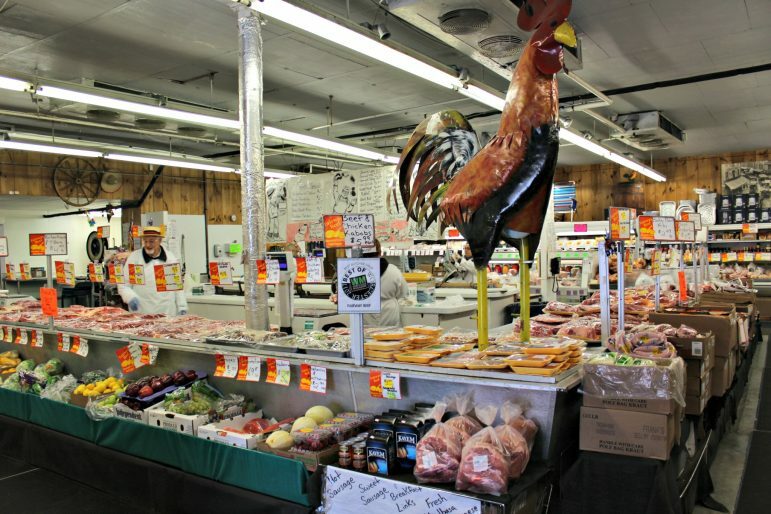 The longstanding meat shop has expanded its offerings in recent years. 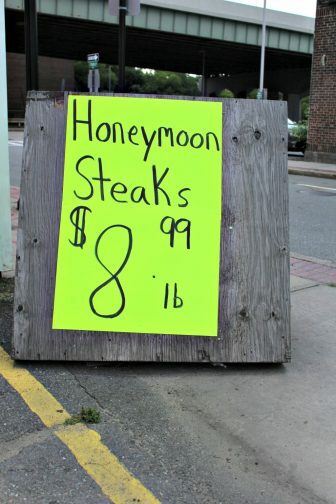 According to Paul Lachance, the meat department manager and an employee here for 25 years, the honeymoon steak is Fairway’s top-selling product. 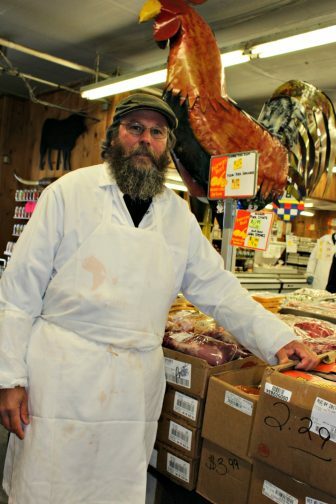 “It’s the real sirloin tip or the tri-tip that sits on the tail of the hip. It’s a big Western piece of meat usually found only on the West Coast. Few places have it on the East Coast. So we’re fortunate we’re able to buy this,” he said. Besides catering to customers’ needs today, the approximately 20 employees at Fairway don’t have to work all three shifts around the clock during the week or on Sundays. The store is open 8 a.m. to 3 p.m. Mondays and Saturdays, and 8 a.m. to 5 p.m. Tuesdays through Fridays. Lachance said, “I worked in supermarkets before … but I came here because the hours were better and there wasn’t a corporate atmosphere, and the benefits were equivalent. He added, “To be an exceptional employee here, providing great customer service is Number 1. Another important thing to have is knowledge of the meat department. Fairway has a website (www.fairwaybeef.com) that is updated on Saturdays for the upcoming specials that run Mondays through Saturdays. According to George, one of the best things about the business is seeing the multiple generations of customers who tell him they used to come here with their parents or grandparents. To honor a few of the outstanding employees who have died over the years, Fairway names special meals after them. For instance, the Jimmy Special is named after Jimmy Niddrie. The $99 FF Jimmy includes 5 lbs. apiece of lean hamburger, London Broil, center-cut pork chops, sausage (hot or sweet), rib-eye round roast and boneless chicken breasts. Another is Tommy K’s BBQ Party Plan. At $69, it’s only available during spring and summer and includes four shish-kabobs (chicken or beef); 5 lbs. of hot or sweet sausage; 3 lbs. of hamburger (Fairway’s own); 3 lbs. of skinless hot dogs; 4 lbs. of country-style ribs and 4 lbs. of chicken-leg quarters. Similar specials can be found on the website.